Dolphin Scuba Center has a complete line for the up and coming diver. The Edge Minnow mask and snorkel combo feature a dual-lens mask designed for the small faces, and a smaller mouthpiece snorkel with purge valve for easy clearing, and high visibility orange tip with wave guard to keep the splash out. The Minnow combo come sin blue and yellow. The Typhoon T-jet kids fin with open heel straps and the Aquasphere Zip fin have smaller foot pockets for tiny feet and allow use of a dive boot or water shoe. The Aquasphere Microfin and the Storm caribe fin have a rubber foot pocket that can be used barefoot or with a 2mm neoprene sock. Also check out the Aquasphere Stingray and Storm Neoprene Shortie wetsuits for kids. These suits protect their skin from sun and marine life while the neoprene version adds buoyancy for ease of flotation. Dolphin Scuba also carries a complete line of swim goggles for kids taking swim classes or just playing in the pool. These are a great way to learn; allowing the child to see underwater takes away the fear and builds self-confidence and comfort. We carry smaller goggles for streamlined hi-speed swimming, and larger goggles for increased vision capability. 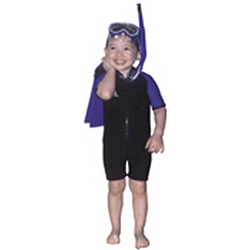 The Typhoon Kids dry snorkel seal up underwater allowing for no-clear breathing on return to the surface. Our individual kid's masks; the Storm Snorkel mask is sure to fit all size faces. We have everything for playing in the pool to your next snorkel vacation!! Check out our all-inclusive vacations to tropical locations. Room, board, meals, and airfare all for one low price. Just click on our travel section.